Long time no chat, friends! I hope you are all doing marvellously wherever you may be in the world. With the year 2018 nearing its last standing ovation, I would like to share little nuggets of bite-sized thoughts and life reminders that I have been pondering over as we move into yet another 365 days to make magic, drive change and share love - and continue to eat epic, nutritious and life-giving vegan food (more on this later)! 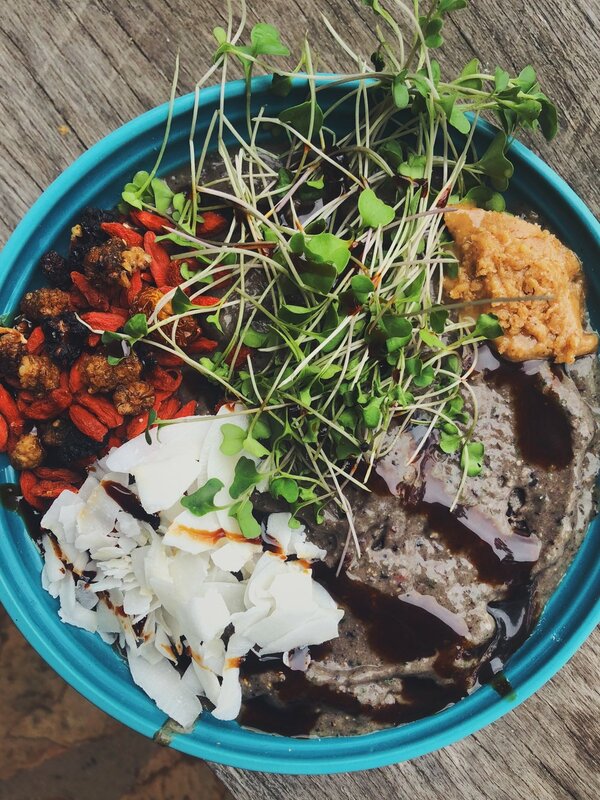 Nom it up with a morning smoothie bowl topped with coconut flakes, berries, sprouts, peanut butter and date caramel. 1. Change limiting beliefs: See failure as a beginning, not an end. 2. Achieve your dreams: If you don't step forward, you're always in the same place. 3. Strive for excellence: Do more than what is expected of you. 4. Have a beginner’s mind: Assume nothing and question everything. 5. Let go of what doesn’t serve you: To find freedom, make peace with the past. 6. Trust your gut: Stop thinking so much and start acting. 7. Be the watcher of your thoughts: When the war in your mind ends, peace emerges. 8. Follow your own path: Don’t compare yourself to others. 9. Connection is the antidote to powerlessness: Step up, listen and share with an open heart and mind. 10. Collaborate and support: The strength of community is each individual member. The strength of each member is the community. The beauty is in the messy. So we know that life will always be throwing us curve balls, right - and 2019 probably won’t be much different. But we can reframe these bouncing, difficult-to-catch curve balls as lessons that we are finally ready to learn from and understand. When we can see each challenge as a gift from the universe that is saying “Well done, I can see you are ready to handle this”, then every tough moment becomes a blessing - and much easier to face and overcome. So on that note, here is a delicious blessing, in the form of a protein-packed, vegan smoothie bowl recipe. Peanut butter and banana has been one of my favourite combos to eat ever! So when Wazoogles came out with their new PB flavour, I was over the moon. As always, it has a great balance of flavour and is filled with all the wholesome things you need to have when you start your day. I threw in some extra greens to my bowl this morning, including spinach, zucchini and microgreens, and added in a sneaky dash of creamy coconut yogurt from Yokos. PS - if you don’t have peanut butter flavoured protein powder, you can always add some real PB or almond butter instead. You can also replace it with a simple vanilla vegan protein powder too. Epic smoothie bowls and nice cream bowls here we come! I hope you enjoy this recipe as much as I did! A Peanut Butterlicious smoothie bowl! Soak 1 cup of dates in hot water for about 5 minutes. In a food processor, blend the dates with the leftover water, adding more as you go, until super smooth. Set aside. Blend the ingredients in a food processor until smooth. Feel free to add some water to help you out. Place the smoothie in a bowl, decorate with your favourite toppings and swirl in the lovely date caramel. Spoon it up and enjoy!